From an Earthly perspective, all creatures on Mars are weird. If the reader has been following this series, he or she has been introduced to a virtual menagerie of Martian fauna, such as the Green Hordes, the Great White Apes, calots, thoats, zitidars, siths, soraks, silians, apts, orluks, and banths, all of which are fascinating in themselves. 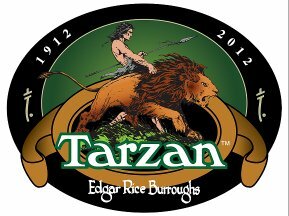 However, two of ERB’s creations stand out in their weirdness: the Plant Men, which appear in Gods of Mars and Warlord of Mars; and the Goolians, who appear in Synthetic Men of Mars. Both groups of these weird creatures are able to leap long distances and have long powerful tails. Both sets of creatures appear to be social in nature, although the system of organization in the Plant Men appears to be more instinctive, whereas the Goolians have a Jeddak form of government evidencing a higher evolved self-conscious form of government. Moreover, while there is nothing amusing about the Plant Men, the Goolians provide the reader with hardy comic relief. 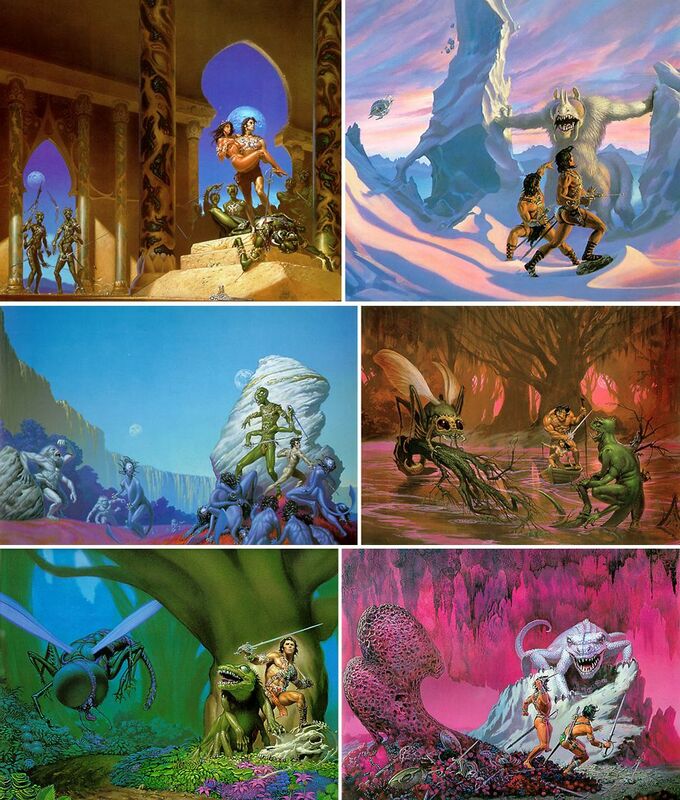 John Carter first comes across the Plant Men at the time of his second advent on Barsoom when he finds himself unknowingly in the Valley Dor, the Martian paradise. Carter awakens naked and unarmed in a forest of gigantic multi-colored trees, a fantasy forest. Beyond the trees he makes out a grassy plain of red vegetation and, rarest of sights on Mars, an open sea. “As I neared the confines of the forest I beheld before me, and between the grove and open sea, a broad expanse of meadow land, and as I was about to emerge from the shadows of the trees a sight met my eyes that banished all romantic and poetic reflection upon the beauties of the strange landscape. “At a little distance up the river rose mighty perpendicular bluffs, from the very base of which the great river seemed to rise. “But it was not these inspiring and magnificent evidences of Nature’s grandeur that took my immediate attention from the beauties of the forest. It was the sight of a score of figures moving slowly about the meadow near the bank of the mighty river. “Odd, grotesque shapes they were; unlike anything that I had ever seen upon Mars, and yet, at a distance, most man-like in appearance. The larger specimens appeared to be about ten or twelve feet in height when they stood erect, and to be proportioned as to torso and lower extremities precisely as is earthly man. “Their arms, however, were very short, and from where I stood seemed as though fashioned much after the manner of an elephant’s trunk, in that they moved in sinuous and snake-like undulations, as though entirely without bony structure, or if there were bones it seemed that they must be vertebral in nature. “As I watched them from behind the stem of a huge tree, one of the creatures moved slowly in my direction, engaged in the occupation that seemed to the be the principal business of each of them, and which consisted in running their oddly shaped hands over the surface of the sward, for what purpose I could not determine. “As he approached quite close to me I obtained an excellent view of him, and though I was later to become better acquainted with his kind, I may say that that single cursory examination of this awful travesty on Nature would have proved quite sufficient to my desires had I been a free agent. The fastest flier of the Heliumetic Navy could not quickly enough have carried me far from this hideous creature. “Its hairless body was a strange and ghoulish blue, except for a broad band of white which encircled its protruding single eye: an eye that was all dead white – pupil, iris, and ball. “Its nose was a ragged, inflamed, circular hole in the center of its blank face; a hole that resembled more closely nothing I could think of other than a fresh bullet wound which has not yet commenced to bleed. “Below this repulsive orifice the face was quite blank to the chin, for the thing had no mouth that I could discover. “The head, with the exception of the face, was covered by a tangled mass of jet-black hair some eight or ten inches in length. Each hair was about the bigness of a large angle-worm, and as the thing moved the muscles of its scalp this awful head-covering seemed to writhe and wriggle and crawl about the fearsome face as though indeed each separate hair was endowed with independent life. “The body and the legs were as symmetrically human as Nature could have fashioned them, and the feet, too, were human in shape, but of monstrous proportions. From heel to toe they were fully three feet long, and very flat and very broad. “As it came quite close to me I discovered that its strange movements, running its odd hands over the surface of the turf, were the result of its peculiar method of feeding, which consists in cropping off the tender vegetation with its razor-like talons and sucking it up from its two mouths, which lie one in the palm of each hand, through its arm-like throats. “In addition to the features which I have already described, the beast was equipped with a massive tail about six feet in length, quite round where it joined the body, but tapering to a flat, thin blade toward the end, which trailed at right angles to the ground. “By far the most remarkable feature of this most remarkable creature, however, were the two tiny replicas of it, each about six inches in length, which dangled, one on either side, from its armpits. They were suspended by a small stem which seemed to grow from the exact tops of their heads to where it connected with the body of the adult. “Whether they were the young, or merely portions of a composite creature, I did not know. “As I had been scrutinizing this weird monstrosity the balance of the herd had fed quite close to me and I now saw that while many had the smaller specimens dangling from them, not all were thus equipped, and I further noted that the little ones varied in size from what appeared to be but tiny unopened buds an inch in diameter through various stages of development to the full-fledged and perfectly formed creature of ten or twelve inches in length. “Feeding with the herd were many of the little fellows not much larger than those which remained attached to their parents, and from the young of that size the herd graded up to the immense adults. It appears, however, that in the ten years that John Carter has gone missing, he has forgotten that very few creatures are innocuous on Barsoom. He is about to discover the true mission of the Plant Men in the Valley Dor and the essential role they play in the Religion of Issus. “Naked and unarmed, as I was, my end would have been both speedy and horrible at the hands of these cruel creatures had I had time to put my resolve into execution, but at the moment of the shriek each member of the herd turned in the direction from which the sound seemed to come, and at the same instant every particular snake-like hair upon their heads rose stiffly perpendicular as if each had been a sentient organism looking or listening for the source or meaning of the wail. 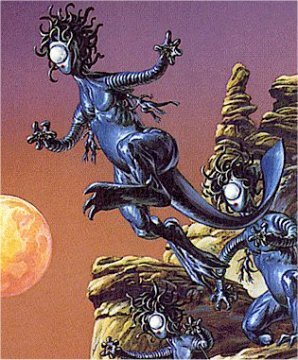 And indeed the latter proved to be the truth, for this strange growth upon the craniums of the plant men of Barsoom represents the thousand ears of these hideous creatures, the last remnant of the strange race which sprang from the original Tree of Life. “Instantly every eye turned toward one member of the herd, a large fellow who evidently was the leader. A strange purring sound issued from the mouth in the palm of one of his hands, and at the same time he started rapidly toward the bluff, followed by the entire herd. “Their speed and method of locomotion were both remarkable, springing as they did in great leaps of twenty or thirty feet, much after the manner of a kangaroo. “They were rapidly disappearing when it occurred to me to follow them, and so, hurling caution to the winds, I sprang across the meadow in their wake with leaps and bounds ever more prodigious than their own, for the muscles of an athletic Earth man produce remarkable results when pitted against the lesser gravity and air pressure of Mars. “Their way led directly towards that apparent source of the river at the base of the cliff, and as I neared this point I found the meadow dotted with huge boulders that the ravages of time had evidently dislodged from the towering crags above. “For this reason I came quite close to the cause of the disturbance before the scene broke upon my horrified gaze. 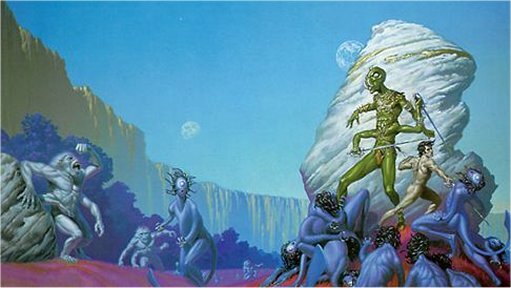 As I topped a great boulder I saw the herd of plant men surrounding a little groupl of perhaps five or six green men and women of Barsoom. “That I was indeed upon Mars I now had no doubt, for here were members of the wild hordes that people the dead sea bottoms and deserted cities of that dying planet. “Here were the great males towering in all the majesty of their imposing height; here were the gleaming white tusks protruding from their massive lower jaws to a point near the center of their foreheads, the laterally placed, protruding eyes with which they could look forward or backward, or to either side without turning their heads, here the strange antennae-like ears rising from the tops of their foreheads; and the additional pair of arms extending from midway between the shoulders and the hips. “Even without the glossy green hide and metal ornaments which denoted the tribes to which they belonged, I would have known them on the instant for what they were, for where else in all the universe is their like duplicated? “There were two men and four females in the party and their ornaments denoted them as members of different hordes, a fact which tended to puzzle me infinitely, since the various hordes of green men of Barsoom are eternally at deadly war with one another, and never, except on that single historic instance when the great Tars Tarkas of Thark gathered a hundred and fifty thousand green warriors from several hordes to march upon the doomed city of Zodanga to rescue Dejah Thoris, Princess of Helium, from the clutches of Than Kosis, had I seen green martians of different hordes associated in other than mortal combat. “But now they stood back to back, facing, in wide-eyed amazement, the very evidently hostile demonstrations of a common enemy. The Plant Men then engage in a manner of tactics, either signifying some form of higher intelligence, or a bit of more sophisticated hunting instinct. “Presently the leader of the plant men charged the little party, and his method of attack was as remarkable as it was effective, and by its very strangeness was the more potent, since in the science of the green warriors there was no defense for this singular manner of attack, the like of which it soon was evident to me they were as unfamiliar with as they were with the monstrosities which confronted them. “The plant man charged to within a dozen feet of the party, and then, with a bound, rose as though to pass directly above their heads. His powerful tail was raised high to one side, and as he passed close above them he brought it down in one terrible sweep that crushed a green warrior’s skull as though it had been an eggshell. “The balance of the frightful herd was now circling rapidly and with bewildering speed about the little knot of victims. Their prodigious bounds and the shrill, screeching purr of their uncanny mouths were calculated to confuse and terrorize their prey, so as two of them leaped simultaneously from either side, the mighty sweep of those awful tails met with no resistance and two more green Martians when down to an ignoble death. “There were now but one warrior and two females left, and it seemed that it could be but a matter of seconds ere these, also, lay dead upon the scarlet sward. “But as two more of the plant men charged, the warrior, who was now prepared by the experiences of the past few minutes, swung his mighty longsword aloft and met the hurtling bulk with a clean cut that clove one of the plant men from chin to groin. “The other, however, dealt a single blow with his cruel tail that laid both of the females crushed corpses upon the ground. “As the green warrior saw the last of his companions go down and at the same time perceived that the entire herd was charging him in a body, he rushed boldly to meet them, swinging his long-sword in the terrible manner that I had so often seen the men of his kind wield it in their ferocious and almost continual warfare among their own race. Carter’s warrior spirit gets the best of him. He makes a half dozen leaps and gains the bloody killing field, then he grabs a long-sword from one of the dead Green Men and hurls himself into the fight. “Swift as I was I was none too soon, for the green warrior had been overtaken ere he had made half the distance to the forest, and now he stood with his back to a boulder, while the herd, temporarily balked, hissed and screeched about him. “With their single eyes in the center of their heads and every eye trained upon their prey, they did not note my soundless approach, so that I was upon them with my great long-sword and four of them lay dead ere they knew that I was among them. “For an instant they recoiled before my terrific onslaught, and, in that instant the green warrior rose to the occasion and, springing to my side, laid to the right and left of him as I had never seen but one other warrior do, with great circling strokes that formed a figure eight about him and that never stopped until none stood living to oppose him, his keen blade passing through flesh and bone and metal as though each had been alike thin air. “As we bent to the slaughter, far above us rose that shrill, weird cry which I had heard once before, and which had called the herd to the attack upon their victims. Again and again it rose, but we were too much engaged with the fierce and powerful creatures about us to attempt to search out even with our eyes the author of the horrid notes. Leave it to ERB to give us that anatomical detail about the Plant Man while Carter and Tars Tarkas are in the midst of dissecting them with their huge swords, giving us a wonderful graphic scene to imagine. “Once I felt the great weight of one of the monsters upon my back and as keen talons sunk into my flesh I experienced the frightful sensation of moist lips sucking the lifeblood from the wounds to which the claws still clung. “I was very much engaged with a ferocious fellow who was endeavoring to reach my throat from in front, while two more, one on either side, were lashing viciously at me with their tails. I just love that description of the moist lips sucking the blood from his back. Anyway, Carter and Tars Tarkas – although Carter is slow to understand that the Green Warrior is Tars Tarkas – stand back to back against the boulder, preventing the Plant Men from their overhead tactic of bashing in their skulls with a flick of their powerful tails. They hear the shrill wail again, and this time see that the wail has summoned a new menace to their sorry predicament: thousands of Great White Apes now join in the carnage. It is at this point, when Carter says that it will be a great death – and the Green Man answers with his name – that Carter realizes that the Green Man next to him is his best friend on two planets. Carter will soon learn why Tars Tarkas was not surprised to find him in Valley Dor. It was precisely the place Tars Tarkas expected to find him. They make a mad dash for the five thousand feet high cliffs where Carter has spied some caves high above at the tree top level. When the sun hits the cliffs at the right angle, Carter perceives that they are made of pure gold, and watches in amazement as they shimmer in the sunlight. They finally make the forest. “At length, however, we reached the shadows of the forest, while right behind us sprang the swiftest of our pursuers – a giant plant man with claws outreaching to fasten his blood-sucking mouths upon us. “He was, I should say, a hundred yards in advance of his closest companion, and so I called to Tars Tarkas to ascend a great tree that brushed the cliff’s face while I dispatched the fellow, thus giving the less agile Thark an opportunity to reach the higher branches before the entire horde should be upon us and every vestige of escape cut off. “But I had reckoned without a just appreciation either of the cunning of my immediate antagonist or the swiftness with which his fellows were covering the distance which had separated them from me. “As I raised my long-sword to deal the creature its death thrust it halted in its charge and, as my sword cut harmlessly through the empty air, the great tail of the thing swept with the power of a grizzly’s arm across the sward and carried me bodily from my feet to the ground. In an instant the brute was upon me, but ere it could fasten its hideous mouths into my breast and throat I grasped a writhing tentacle in either hand. more like tentacles, which are always a lot more creepy. I also like the counterintuitive idea of Carter strangling the Plant Man by squeezing his tentacles, for they are indeed the throats of the Plant Men. Then the Great White Apes reach them. “It was into the eyes of such as these and the terrible plant men that I gazed above the shoulder of my foe, and then, in a mighty wave of snarling, snapping, screaming, purring rage, they swept over me – and of all the sounds that assailed my ears as I went down beneath them, to me the most hideous was the horrid purring of the plant men. “Instantly a score of cruel fangs and keen talons were sunk into my flesh; cold, sucking lips fastened themselves upon my arteries. I struggled to free myself, and even though weighed down by these immense bodies, I succeeded in struggling to my feet, where, still grasping my long-sword, and shortening my grip upon it until I could use it as a dagger, I wrought such havoc among them that at one time I stood for an instant free. “What it has taken minutes to write occurred in but a few seconds, but during that time Tars Tarkas had seen my plight and had dropped from the lower branches, which he had reached with such infinite labor, and as I flung the last of my immediate antagonists from me the great Thark leaped to my side, and again we fought, back to back, as we had done a hundred times before. 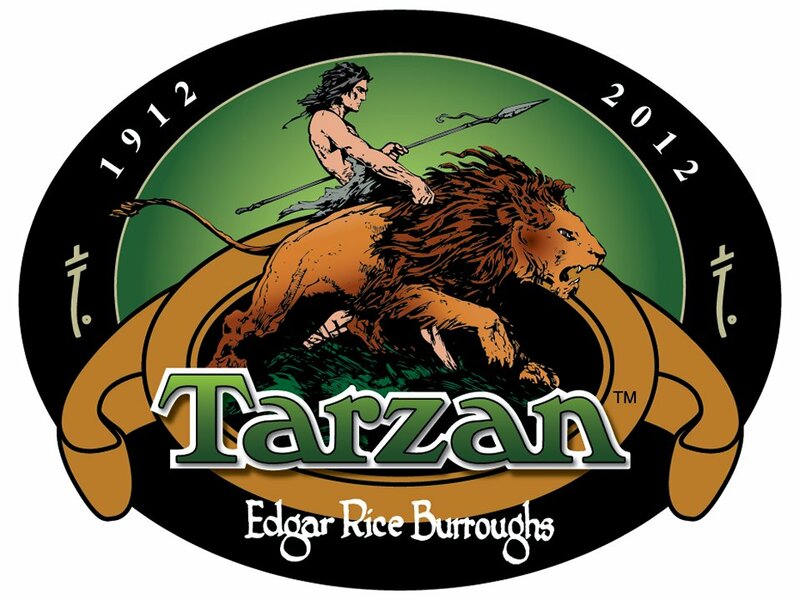 “Time and again the ferocious apes sprang in to close with us, and time and again we beat them back with our swords. The great tails of the plant men lashed with tremendous power about us as they charged from various directions or sprang with the agility of greyhounds above our heads; but every attack met a gleaming blade in sword hands that had been reputed for twenty years the best Mars ever had known; for Tars Tarkas and John Carter were names that the fighting men of the world of warriors loved to speak. “But even the best two swords in a world of fighters can avail not for ever against overwhelming numbers of fierce and savage brutes that know not what defeat means until cold steel teaches their hearts no longer to beat, and so, step by step, we were forced back. At length we stood against the giant tree that we had chosen for our ascent, and then, as charge after charge hurled its weight upon us, we gave back again and again, until we had been forced half-way around the huge base of the colossal trunk. It is at this point that Carter and Tars Tarkas have their semi-amusing argument over who is to be first down the large rabbit hole-like entrance that Tars Tarkas has discovered at the base of the trunk. In the end, Carter orders Tars Tarkas down the hole and the Green Jeddak obeys reluctantly. “As he dropped to the ground to force his way into the tree, the whole howling pack of hideous devils hurled themselves upon me. To right and left flew my shimmering blade, now green with the sticky juice of a plant man, now red with the crimson blood of a great white ape; but always flying from one opponent to another, hesitating but the barest fraction of a second to drink the lifeblood in the center of some savage heart. “And thus I fought as I never had fought before, against such frightful odds that I cannot realize even now that human muscles could have withstood that awful onslaught, that terrific weight of hurtling tons of ferocious, battling flesh. Then Tars Tarkas grabs him by the ankles and pulls him down into the hole and out of the grasp of the fiendish foes. They climb a ladder, enter a cave above, wander down a corridor, find themselves in the Chamber of Mystery, fight banths and therns, then free Thuvia, who explains to them the function of the Plant Men in the religious world view of Issus. “‘The therns are mortal,’ she replied. ‘They die from the same causes as you or I might; those who do not live their allotted span of time, one thousand years, when by the authority of custom they may take their way in happiness through the long tunnel that leads to Issus. “‘Those who die before are supposed to spend the balance of their allotted time in the image of a plant man, and it is for this reason that the plant men are held sacred by the therns, since they believe that each of these hideous creatures was formerly a thern. “‘And should a plant man die?’ I asked. They escape together, and as they make their way through the labyrinth corridors of the giant cliffs of the Otz Mountains, they come across an opening that allows them to peer down on the balcony from which the Therns call the Plant Men to the feast. “At our right the sun was setting, a huge red orb, below the western range of Otz. A little below us stood the Holy Thern on watch upon his balcony. His scarlet robe of office was pulled tightly about him in anticipation of the cold that comes so suddenly with darkness as the sun sets....From brilliant light you are plunged without warning into utter darkness. Then the moons come; the mysterious, magic moons of Mars, hurtling like monster meteors low across the face of the planet. “The declining sun lighted brilliantly the eastern banks of Korus, the crimson sward, the gorgeous forest. Beneath the trees we saw feeding many herds of plant men. The adults stood aloft upon their toes and their mighty tails, their talons pruning every available leaf and twig. It was then that I understood the careful trimming of the trees which had led me to form the mistaken idea when first I opened my eyes upon the grove that it was the playground of a civilized people. “As we watched, our eyes wandered to the rolling Iss, which issued from the base of the cliffs beneath us. Presently there emerged from the mountain a canoe laden with lost souls from the outer world. There were a dozen of them. All were of the highly civilized and cultured race of red men who are dominant on Mars. “The eyes of the herald upon the balcony beneath us fell upon the doomed party as soon as did ours. He raised his head and, leaning far out over the low rail that rimmed his dizzy perch, voiced the shrill, weird wail that called the demons of this hellish place to the attack. “For an instant the brutes stood with stiffly erected ears, then they poured from the grove toward the river’s bank, covering the distance with great, ungainly leaps. “The party had landed and was standing on the sward as the awful horde came in sight. There was a brief and futile effort of defense. Then silence as the huge, repulsive shapes covered the bodies of their victims and scores of sucking mouths fastened themselves to the flesh of their prey. “I turned away in disgust. Later, Carter is captured by the Black Pirates and while bound within one of their warships, he tells Phaidor, daughter of the leader of the Holy Therns, his ultimate intention toward the Plant Men. This, of course, horrifies Phaidor, for such ideas threaten the very existence of the Therns. After Carter becomes Warlord of Mars we are not told if Carter ever attempted to carry out his threat of extermination. If he changed his mind, it was perhaps because of the compliancy of the Plant Men toward the First Born that he witnesses as he and his son, Carthoris, are marched off through the Valley to the arena for the gladiator games. “When we reached the gardens of Issus we were led away from the temple instead of toward it. The way wound through enchanted parks to a mighty wall that towered a hundred feet in the air. “So it was that I remained hidden until after Thurid had disappeared over the edge of the steep bank beside the sea a quarter of a mile away. Then, with Woola following, I hastened across the open after the black dator. “The quiet of the tomb lay upon the mysterious valley of death, crouching deep in its warm nest within the sunken area at the south pole of the dying planet. In the far distance the Golden Cliffs raised their mighty barrier faces far into the starlit heavens, the precious metals and scintillating jewels that composed them sparkling in the brilliant light of Mars’s two gorgeous moons. “At my back was the forest, pruned and trimmed like the sward to parklike symmetry by the browsing of the ghoulish plant men. “Before me lay the Lost Sea of Korus, while farther on I caught the shimmering ribbon of Iss, the River of Mystery, where it wound out from beneath the Golden Cliffs to empty into Korus, to which for countless ages had been borne the deluded and unhappy Martians of the outer world upon the voluntary pilgrimage to this false heaven. “The plant men, with their blood-sucking hands, and the monstrous white apes that make Dor hideous by day, were hidden in their lairs for the night. “There was no longer a Holy Thern upon the balcony in the Golden Cliffs above the Iss to summon them with weird cry to the victims floating down to their maws upon the cold, broad bosom of ancient Iss. The Plant Men play no major role in any of the other stories in the Barsoomian Mythos, and since their function was mainly to drain people of blood before the Therns could eat them, and since it is assumed that cannibalism too was made taboo after their defeat, there does not seem to be a legitimate function for these animals in Valley Dor. Unless it is for the gardening skills of the Plant Men. Perhaps they were allowed to exist for that sole reason, if they were allowed to exist at all. We will deal with the Goolians in the next part.